This is incorrect. You care about the sum total of all restrictions. An 1/8" orifice that is 1/4" long is way different than 10 feet of 1/8" line as an example. Any small opening (such as a fitting) that is a restriction causes the fluid to speed up to pass through at a given flow, this causes higher frictional losses due to velocity. It takes pressure to overcome the restriction. Line loss is a function of distance. If 1 foot of line loses 1 psi at a given flow, then 5 feet would result in approximately a 5 psi loss. I think both of you are correct. If you look at what he wrote he stated the smallest opening would be the highest restriction. He wasn't stating that the remaining line had no contribution to the overall pressure drop, just the highest restriction was the smallest opening. 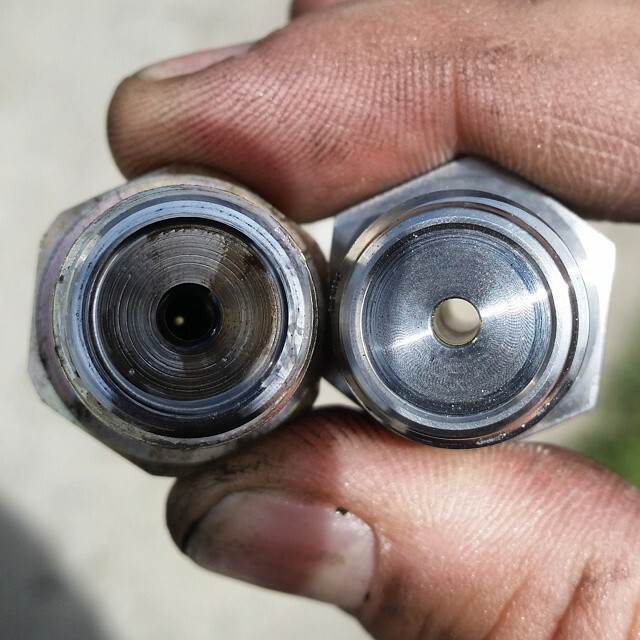 If you’re talking about the inlet fitting that supply hose connects to, here are a few pictures I took of a stock fitting and the 1/2” fitting I drilled out. I was afraid to go any bigger because I didn’t want to get the metal too thin where it steps down at the top of the threads for the o-ring seal. I also used a bigger drill bit to put a chamfer on the end so the fuel would be somewhat funneled into the opening rather than hitting a square edge. If the restriction at the end of the line is fixed and pressure is controlled by a regulator of sorts to maintain steady pressure, providing the pump can maintain the flow to achieve said pressure, larger line size will gain you nothing. Going 1/2” to 5/8” but still putting it through a 1/8” orfice at the end of the line over say 10’ of hose will not change the flow rate through the orfice. This in terms is speaking of an application in a vehicle where friction loses are almost negligible. In 100’ of hose, hose size matters more as you would lose flow to friction although this can be overcome by a higher volume pump but also increases heat into the system. However if you increase the orfice size or add a second orfice in parallel to the first i.e. dual cp3 then yes a larger line size may benefit you as would running two lines from the outlet of the pump. Keep in mind you are still limited by the smallest restriction-which in some cases may even be the pump outlet. Hence why a -12 pump outlet in most of our trucks is ideal to allow for increased flow requirements downstream as desired. 6AN will be fine to the CP's. The fitting on a stroker CP is 6AN. My line is 10AN from the 250 FASS, splitting to 2-6AN's to the pumps. Top pump is a big stroker, bottom is stock......125% injectors get plenty of fuel.